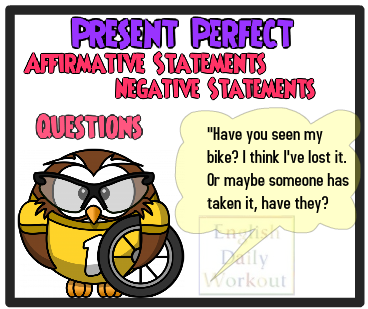 As is the case with other English tenses, questions and negative statements in the Present Perfect are formed using the auxiliary. In the case of the Present Perfect, the auxiliary is have or has. I have worked. Have I worked? You have worked. Have you worked? He has worked. Has he worked? She has worked. Has she worked? It has worked. Has it worked? We have worked. Have we worked? They have worked. Have they worked? I have worked. I have not worked. You have worked. You have not worked. He has worked. He has not worked. She has worked. She has not worked. It has worked. It has not worked. We have worked. We have not worked. They have worked. They have not worked. Have I not worked? Haven't I worked? Have you not worked? Haven't you worked? Has he not worked? Hasn't he worked? Has she not worked? Hasn't she worked? Has it not worked? Hasn't it worked? Have we not worked? Haven't we worked? Have they not worked? Haven't they worked? Tag questions are also formed using the auxiliary. In the following examples, the negative tag questions are underlined. I have worked. I have worked, haven't I? You have worked. You have worked, haven't you? He has worked. He has worked, hasn't he? She has worked. She has worked, hasn't she? It has worked. It has worked, hasn't it? We have worked. We have worked, haven't we? They have worked. They have worked, haven't they? Following the model of the examples, rewrite the following affirmative statements as questions, negative statements, negative questions without contractions, negative questions with contractions, and affirmative statements followed by negative tag questions. 1. Have they eaten the cookies? They have not eaten the cookies. Have they not eaten the cookies? Haven't they eaten the cookies? They have eaten the cookies, haven't they? 2. Has she told the truth? She has not told the truth. Has she not told the truth? Hasn't she told the truth? She has told the truth, hasn't she? 3. Has he run fast? He has not run fast. Has he not run fast? Hasn't he run fast? He has run fast, hasn't he? 4. Have we watered the plants? We have not watered the plants. Have we not watered the plants? Haven't we watered the plants? We have watered the plants, haven't we? 5. Have you hurried? You have not hurried. Have you not hurried? Haven't you hurried? You have hurried, haven't you?